Edison Pen Co – New From Edison! The Draw Filler! New From Edison! The Draw Filler! I’m super-excited to share our latest filling system. The Draw Filler! Have a look at this video and I’ll give some more details below. This is a new filler, not a new model of pen. This filler can be added to any of our pen models. This filler uses chemically resistant o-rings rather than latex, so there are no restrictions regarding inks that you can us in this pen. Pens that use latex such as our Pump, Pneumatic, and Bulb Fillers need to avoid a few inks or the latex can be damaged. This is not the case with the Draw Filler. 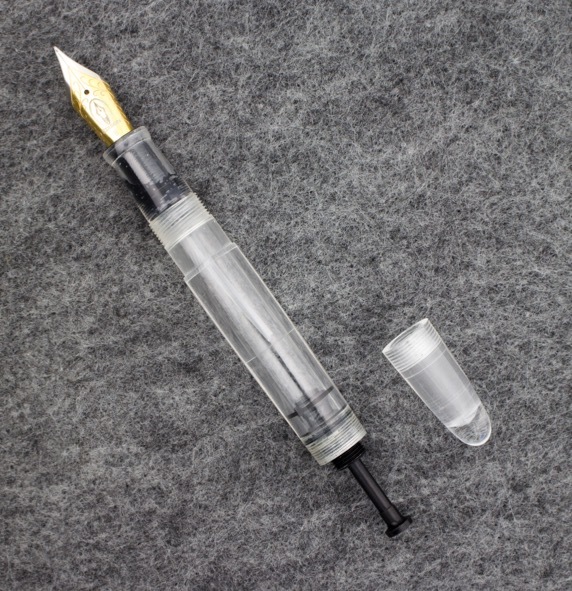 However, if the pen has an ink window or is translucent, we still don’t recommend harsh inks as they could certainly stain the interior of the pen. The Draw Filler works just about the same as the Pump Filler, but there is no spring to retract the piston unit. So you will need to push and pull the Draw Filler mechanism, rather than only pushing the Pump Filler mechanism. Due to the Draw Filler mechanism displacing more volume, it will fill faster, empty faster, and have a greater ink capacity than our Pump Filler (Draw = 2.0mL, Pump = 1.7mL). The mechanism is made of a sturdy anodized aluminum. We do have some of these Draw Fillers that are currently inventoried and ready to ship! You can see them here. Here is the full gallery of all examples of Draw Fillers, or see the slideshow below. Price is the same as our other more “exotic” fillers. This mechanism will add $100 to the price of what a pen would have been as a converter filler. So ballpark of $300-450 depending upon model and Steel vs. 18k nib. Is it possible to have a pump filling pen retrofitted with this filler? We can’t retrofit the existing Pump Barrel, sorry! We’d have to remake the entire barrel as a Draw Filler since the engineering is very different. But this is not a problem and we can do this. Email me if you are interested Thanks! Oo this is definitely a great revision. Could I possibly suggest adding a small coil spring to the black bar you depress for filling? It will help make the mechanism one handed and also help the mechanism to be easier to use. There’s a fine “goldilocks zone” in the relationship of the inner barrel diameter and the oring outer diameter. Too tight = excessive friction. Too loose = leak. I did think about a spring, but I wasn’t sure how to find one that would be strong enough to overcome the friction created by the orings within this goldilocks zone. It’s not a lot of friction by any means, but small springs only get so strong. I tried a spring from one of our Pump Fillers, but it wasn’t strong enough. After prototyping this, I never found it to be a bother. The beta-testers that have been out in the field never received any negative feedback regarding this. But for those who this is an issue, obviously our Pump Filler is a good option. Mr. Gray, I love the looks of this new filling mechanism. I like how it is all-manual without a spring. Thanks for coming out with all these exciting filling mechanisms! Just a question, what inks should be avoided with the bulb, Pneumatic, and Pump fillers? Thanks so much for the kind words! Regarding inks, email me and I’ll discuss. I don’t want to publicly name inks for risk of seeming that I’m bashing another company’s product. These inks in question are great, but they need to stay away from latex. Thanks so much Ron! I appreciate your kind words! Brian, the Draw Filler is a wonderful design, congratulations. My favorite of all designs. I love the practicality of the piston design, anodized aluminum rod, everything! This appeals to me more than any alternate to the cartridge/converter pen. Elegant and oh so practical. Well done. Hi there, just wondering, is it possible to put the draw filler onto the pearlette? At this point I haven’t done the engineering for a Draw Filler Pearlette, but I will be. I see no reason why it wont’ work…I just need to get it done, which should be within the next month or so. Thanks! Two questions. Have you done the engineering to integrate the draw filler into the Glenmont? Can the draw filler be used with ebonite pens? I haven’t done the engineering on the Glenmont yet, but I will be soon. If you place a custom order, our backlog is currently 14 weeks, so I’ll certainly have the engineering done by then. An no problem with ebonite. Thanks! Hi Brian, what would be the price of a Beaumont with customized material and draw filler? When writing, is the cap of the Beaumont Draw Filler also placed higher on the pen as with the Beaumont Pneumatic? Edison Pen Co – Michigan Pen Show!